I love this time of year, where the seasons start to change and you’re looking forward to crispy sunny mornings. Also the promise of new fruit and vegetables that come in to season too. There’s a lane very close to Holyrood Park and every year it has the best spot for picking brambles. And what a better way to pair them with than apples for my healthy apple and bramble crumble. 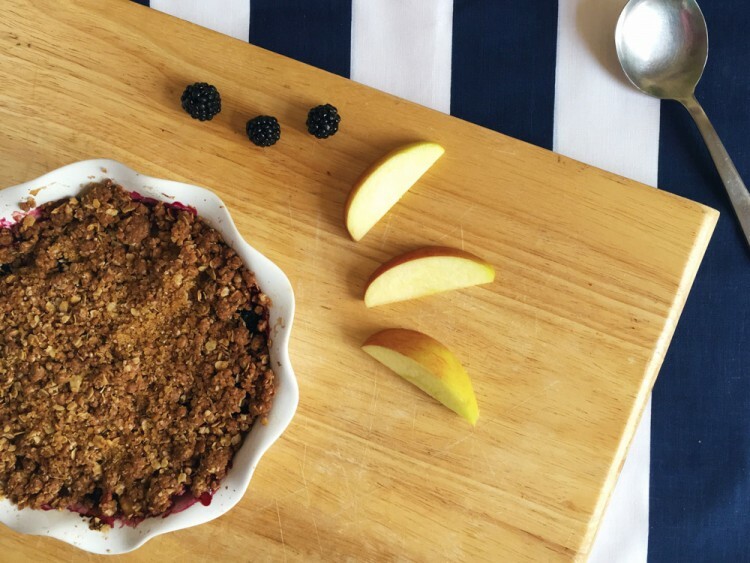 What’s lovely about this recipe is that there is no extra sugar with the apple and bramble mix and the crumble topping makes this sweet enough. Preheat your over to 180c. Measure out the brambles and take a sieve and give them a quick wash under cold water. Take the apples, peel and slice them into strips. Measure the flour, oats and add the cinnamon and stir together. Then cut up the butter in to cubes and start to mix this in to the crumble with your fingertips. Keep doing this until all the butter has mixed in. When it starts to feel like a crumble with your fingertips then you know you are done. Layer some apples in a deep dish and then some brambles. Keep doing this until you’re near the top of the dish. Place in your oven and cook for 45 minutes, it should be golden on top and a slight bubbling coming from the crumble. Enjoy hot with a splash of milk!